18th Communist Party of China (CPC) CONGRESS was successfully held in Beijing from November 8- 14, 2012. This glorious 18th CPC Congress elected the leaders of the 5th generation of China. Accordingly Mr. Xi Jinping was elected the Sectary General of the CPC. A four member delegation from China Association of International Understanding CAFIU led by Hon'ble Mr. Liu Kaiyang which visited Nepal during 21-24 April, 2016 was received by China Study Center CSC, on 23rd April for exchange of views on matters of mutual interest. Its Acting Chairman Mr. Sundar Nath Bhattarai welcomed Deputy Secretary General of China Association of international Understanding (CAFIU) and its members and also hosted a luncheon in their honour on behalf of the members of China Study Center, and its Chairman, who could not be present, due to his in disposition. Acting Chairman in his welcome address said that CAFIU is a highly celebrated Think-Tank of wide reputation of China, and CSC had had the pleasure of welcoming CAFIU delegations, on several occasions in the past, and had intimate interactions with them in Kathmandu as well as in China. His Excellency Ai Ping and other high dignitaries of CAFIU do remain in its fond memory. CSC greatly values their understanding, advice and overtures towards this Center and the Nepalese people as a whole. He also appreciated the role being played by CAFIU in Nepal and welcomed the collaborative endeavor between CAFIU and NCWA initiated by recently signing a MOU between them. In addition, he also made the following remarks: 'Between our two countries, we have profound feelings of goodwill, respect and trust. Nepal is fully appreciative of China's comprehensive Cooperation and support which have been constant and continuous, irrespective of different situations prevailing in the region. You all know of the adverse situations through which we had to undergo recently, first, due to devastating Earthquake, and second, due to third Indian blockade which pushed our economy to the brink of near collapse. On both situations, Chinese cooperation and helps rendered us tremendous support and proved to be good deeds of a friend in need. We have highly valued the outcome of our Prime Minister K. P. Sharma's Oli visit to China during which, thanks to the sense of understanding and cooperation of the China's leadership, it culminated into various important agreements and programmes of cooperation not only beneficial to Nepal but also highly important in view of regional peace and harmony, and enhancement of Trans-Himalayan connectivity. We are well aware of China's policy of good neighbourness and peaceful regional development pursued by the present Fifth Generation Leadership of China under President Xi Jinping. Nepal, being China's next door neighbour, developing as a viable gateway to South Asia for China, stable and peaceful Nepal is definitely in China's interest; as a weak and unstable Nepal will be in adversity of regional harmony as well. We would like to see China's robust presence in Nepal's developmental activities, which has not been so apparent in the present days, and to come forward to substantively help Nepal in the implementation of the programmes and projects, already agreed upon and as a follow up of all understandings and important agreements reached at, during Prime Minister K.P. Oli's visit to China. Nepalese people are looking forwards to more high level visits including that of President Xi Jinping and PM Li Keqiang to Nepal in near future which, we expect, would open up more concrete areas, such as water resources and Tourism, and on areas which is being termed as 'Strategic' for mutual cooperation, which, will take the relation to a new height for mutual benefit. The China Study Center would be looking forward to working together in cooperation with CAFIU in all spheres of common concern of ameliorating relations between our two countries and people'. In response, the Deputy Security General Mr. Liu Kaiyang said 'China-Nepal relations are historical and marked by close friendship and mutual cooperation. They recent visit of Nepalese Prime Minister to China was highly successful in strengthening the existing mutually beneficial relations. CAFIU is eager to see that the agreements reached during the visit are implemented in mutual cooperative efforts. CAFIU, on its part, will pursue its objective of broadening understanding between the two countries through cooperative collaborations between relevant organizations'. 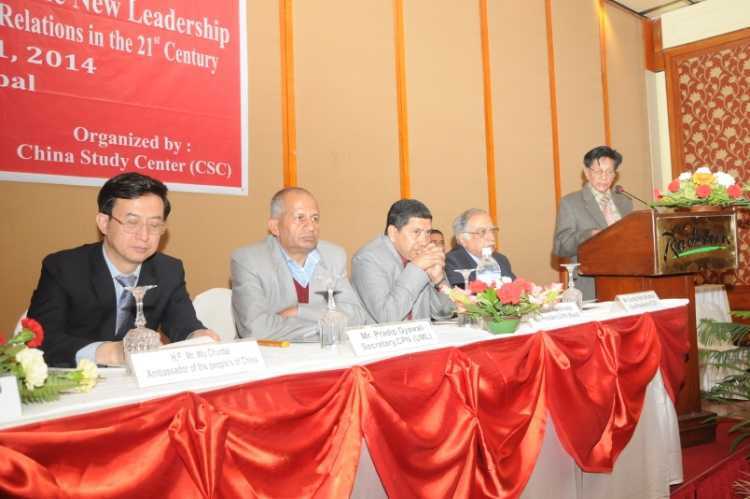 Dr. Upendra Gautam, the Secretary General of CSC, explaining the objectives of CSC elaborated upon the relationship between CSC and CAFIU and said, in essence, 'the recent bilateral agreements between Nepal and China lay out the 21st century's most amazing and doable strategic vision. These agreements help built and promote Nepal's existing national capability, very essential for safeguarding Nepal's national interest which cannot be protected with low national capability and low independent status of the country'. The executive member of China Study Center Mr. Ganga Prasad Upreti, member Dr. Prakash Neupane, its advisor Dr. Mohan Lohani and other guests which included Dr. Rajendra Shrestha, President and its Secretary Gerneral Dr. Shreedhar Gautam of NCWA and Ms. Purna Shova Chitrakar, President of Nepal-China women society were also present. Besides its leader Mr. Liu Kaiyang, other members of the CAFIU delegation was composed of Ms. Wang Lin, Division Director, Ms. Yang Xioyi and Mr. Yuan Hao. China Study Center organized a Talk Programme on China-Nepal Relation with Special reference to Rt. Hon'ble Prime Minister Mr. K. P. Sharma Oli's recent visit to China and released of a book on Paramount Leader of China by Deng Rong and a special issue of "Friendship", the periodic Journal of China Study Center. together with Presidising Chairman Mr. Sundar Nath Bhattarai (second from right) seated at the dais. Hon’ble Chandra Prakash Mainali, Deputy Prime Minister and Minister for Women, Children and Social Welfare was the Chief Guest, while His Excellency Mr. Wu Chuntai, Ambassador of the People’s Republic of China, was the Guest of Honour. Acting Chairman of China Study Center Mr. Sundar Nath Bhattarai, who presided the Talk Programme, delivered the welcome speech in which he referred to the positive outcome of the recent visit of the Prime Minister of Nepal to China and observed that PM's visit, including that to BOAO, was highly successful. He was of the opinion that Agreements and Joint Statement, bestowed with transit rights for Nepal's free excess to see through Chinese ports, and many other areas of Nepal's benefits, have opened up new vista of cooperation and collaboration and Trans-Himalayan connectivity boosting bilateral relations to a new height of strategic relationship. He hoped that the visit would further consolidate Nepal-China relations. 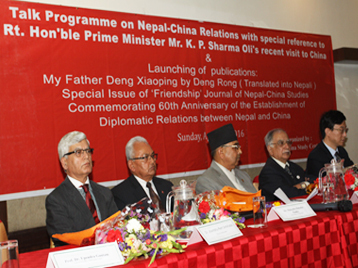 The Chief Guest and the Guest of Honour jointly released two publications, namely, Special Issue of ‘Friendship’ Journal of Nepal-China Studies to mark the 60th Anniversary of the establishment of diplomatic relations between Nepal and China(1955-2015) and a book 'My Father Deng Xiaoping' by his distinguished daughter Madam Deng Rong, translated into Nepali, by China Study Center. Dr. Upendra Gautam,CSC General Secretary, highlighted the significance of these two publications and observed that Nepal-China relations are marked by mutual understanding and that both countries ‘need each other for peace and prosperity not only at bilateral level but also in the entire region’. the Publications with Presidising Chairman Mr. Sundar Nath Bhattarai at the Center. The Talk Programme was addressed by distinguished speakers, namely, Hon’ble Mahendra Bahadur Pandey, former Minister for Foreign Affairs, Dr. Shambhu R Simkhada, former ambassador and Prof. Dr. Madan K Dahal, senior economist. The three speakers looked at the recent visit of the Prime Minister to China from various perspectives focusing on the outcome and implementation aspect of the Agreements and the Joint Statement, political and strategic significance of the PM’s visit and the economic implications of the Agreements and the Joint Statement. All the speakers described the agreement on Transit-Transport as a major achievement which would reduce Nepal’s dependency on a particular country and make this country ‘land linked’ rather than land-locked’. Former Minister for Foreign Affairs Mahendra Pandey remarked that PM Oli’s recent visit to China had further enhanced the deeply rooted relations between the two countries. He was of the opinion that each country has its own perceptions in context of its history, culture and environment and Nepal need not take them otherwise. He said that China is an intimate friend of Nepal in the context of history, culture and geography and added that PM's visit has opened up new avenues of cooperation and development. Dr. Shambhu Simkhada, foreign affairs expert and former ambassador, made the following observation: ‘Nepalese see China as a friendly neighbor and a benign neighborhood power, ready to help whenever it can but keeping its hands off policy in Nepal’s internal affairs’. Dr. Simkhada in his paper talked about great trans- Himalayan civilizations and pleaded strongly for the establishment of a Trans-Himalayan Institute of higher learning for exchange of scholarship and experience from both sides of the Himalayas. Prof. Madan Dahal, in his presentation, compared the economies of both Nepal and China and observed that Nepal’s economic development is a challenging proposition and a painful struggle for ‘survival and growth’. HE Mr. Wu Chuntai making his remarks. DPM Hon'ble CP Mainali making his remarks. Chief Guest Hon’ble Mainali commended China Study Center for its two publications and paid glowing tributes to China’s Paramount Leader Deng Xiao Peng and dwelt at some length on the historical evolution of Nepal with its geo-political location between the two Asian giants. The Chinese ambassador also commended the Center for two publications and thanked the center for its "continued contribution to enhancing Nepal-China friendship over the past decades". He said that it was highly appreciative of the center to bring out the Nepalese translation of the book on Deng Xiaoping, who, he said was "The Chief-Architect of China's Reform and Opening-Up which led to tremendous economic and social progress in china and fundamentally changed China's international status". Ambassador Wu emphasized that "China respects the right of Nepal to choose its own development path and stands ready to enhance cooperation and coordination in bilateral, regional and international level". "That's our commitment", he said. Describing Nepal and China as "good neighbors, who enjoy historical friendship and comprehensive cooperation". He concluded his remarks by emphatically saying: ‘Let us join hands and work together'. Prof. Dr. Mohan Lohani, CSC advisor, proposed the vote of thanks. The programme was largely attended by scholars, intellectual, political leaders, academics, civil society members, former diplomats and friends of the media. Both publications were distributed to the participants free of cost. Mr. Gerard Toffin, Director of French National Center for Scientific Research and Professor of Nepali Civilzation under the National Institute of Oriental Language and Civilization in Paris called on the officials of China Study Center and exchanged views on various aspects of Nepalese culture including development of Lumbini and international cooperations to it. Present on the occasion from China Study Center were its Chairman Mr. Madan Regmi, Vice-Chairman Mr. Sundar Nath Bhattarai, General Secretary Dr. Upendra Gautam and membars Mr. Rudra Sharma and Mr. Pramod Sedain. Mr. Toffin was stationed in Kathmandu during early 1970s as Cultural Attachè in the French Embassy. He has undertaken various research works on Nepalese culture including Newari and Tamang religion and language. He has on his credit scores of books which include; Nepal Past and Present 1993 and La Quete de L'Autre: L'ethnologie d'hier à aujourdhui 2005. 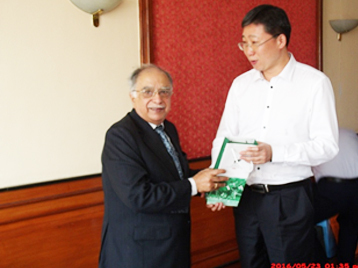 Visit by the Delegation of CICIR led by First Vice-President Prof. Yang Mingjie to Nepal at friendly invitation of China Study Center, Dec. 18- 22, 2014. CICIR delegation led by First Vice President, Prof. Yang Mingjie with Rt. Hon'ble Mr. Sushil Korala, Prime Minister. 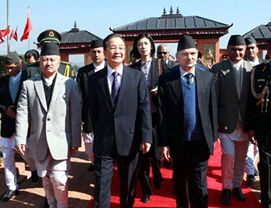 A high level five member delegation of China Institutes of Contemporary International Relations, (CICIR) Beijing, led by First Vice President, Prof. Yang Mingjie visited Nepal from December 18, 2014 to December 22, 2014 at the friendly invitation of its Counterpart China Study Center (CSC), Nepal. Other members of the delegation were Dr. Hu Shisheng, Director, Asian and Oceanic Dept., Dr. Fu Xiaoqiang, Senior Research Scholar, Dr.Wang Shida, Chief of South West Asia Studies Institute of South, Southeast Asian and Oceanian Studies, Mr. Cai Di, Research Scholar. CICIR is the biggest and one of the noted think tanks of China under the State Council. During the visit, the delegation, apart from holding bilateral talks with Chairman and office bearers of China Study Center, was acquainted with the political and economic situation of Nepal, in particular the constitution making process as well as the entire gamut of Nepal-China relation. The Center also hosted a dinner in work of the delegation. The delegation paid courtesy calls on several dignitaries of this country, namely, RT. Hon'ble PM Sushil Koirala Deputy PM and Home Minister Hon'ble Bam Dev Gautam, Hon'ble Mahendra Bahadur Pandey, Minister for Foreign Affairs. The delegation also paid courtesy calls on CPN-UML Chairman Hon'ble K P Oli, UCPN (Maoist) Chairman and Former PM Hon'ble Pushpa Kamal Dahal 'Prachanda', Mr. Mohan Bhaidhya 'Kiran' Chairman of CPN-Maoist and Chief Secretary, Government of Nepal Mr. Leela Mani Paudel. Courtesy calls were farther paid by the delegation on Mr. Surya Prasad Silwal, secretary of the Ministry of Home Affairs Mr. Upendra Kant Aryal, Inspector General of Nepal Police and Mr. Osh Raj Onta, Inspector General of Armed Police Force. The delegation had a meeting with officials of Gumba Management Committee. 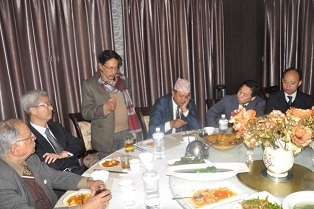 Former Deputy Prime Minister and CA Member Hon'ble Sujata Koirala hosted a dinner in honour of the delegation. Likewise, the Nepal Council of World Affairs and H.E. Wu Chuntai, Ambassador of Nepal hosted luncheons in honour of the delegation CSC Mid-East Regional, Chapter also hosted a dinner in honour of the visiting delegation. The delegation was satisfied with the visit and described it as fruitful. It left for home on 22 Dec. 2014. China Study Center welcomes CICIR delegation at a dinner. 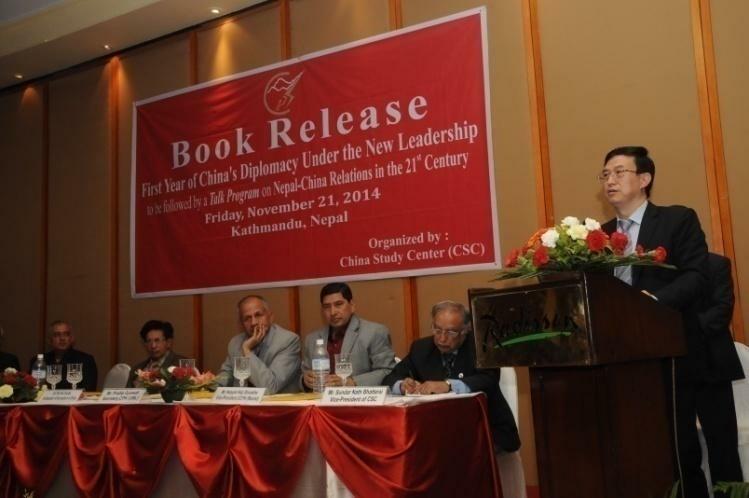 A book entitled 'First Year of China's Diplomacy Under the New Leadership" published by China Study Center was released on Friday 21st November, 2014 by Rt. Hon'ble Chairman of the Constituent Assembly Mr. Subas Chandra Nembang who was joined by His Excellency Mr. Wu Chuntai, the Ambassador of the People's Republic of China, in releasing the book. Commentators on the book were Prof. Dr. Krishna Pokhrel and Prof.Dr.Meena Vaidya Malla, Head, Central Department of Political Science,TU. 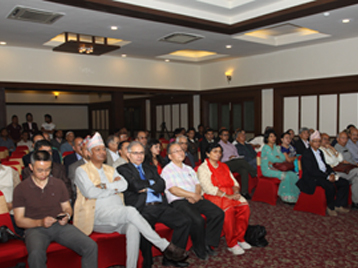 The book launch function was followed by a Talk Programme on Nepal-China Relations in the 21st Century. The speakers comprised Rt. Hon’ble Subas Chandra Nembang, H. E. the Chinese Ambassador, Mr. Shashanka Koirala,CA member of Nepali Congress, Mr. Pradip Gyawali of CPN (UML) , Mr. Narayan Kaji Shrestha, CA member and Deputy Leader of UCPN (Maoist )and Mr. C. P. Gajurel, Vice-Chairman of CPN (Maoist) . Rt. Hon'ble Chairman Nembang, after having formally released the book, urged the political parties to come together and reach agreement as soon as possible to give the country a way out by writing a new constitution. 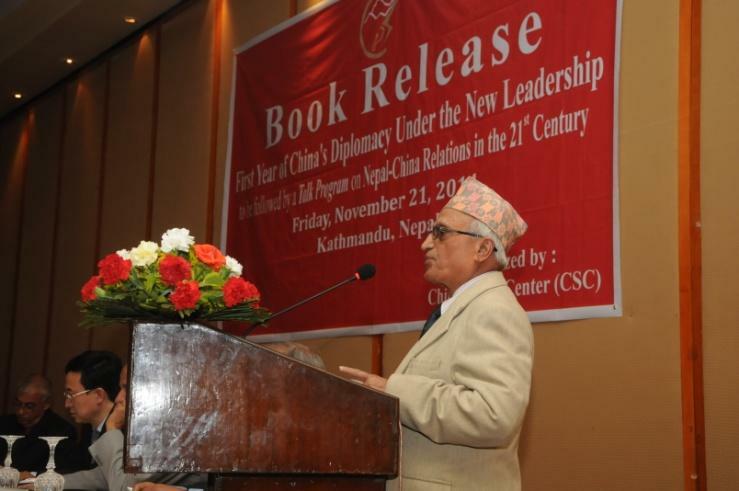 Madan Regmi, Chairman of CSC, who was chairing the function, said that the book dealt with achievements of China as the outcome of diplomatic initiatives taken by the new leadership. As mentioned in the book, the new leadership of China, he further said, has given priority to improving and promoting relations with all countries, in particular neighboring countries. Prof. Dr. Mohan Lohani, editor of the book, said that the book contains thought provoking articles by senior leaders of different political parties, former Prime Minister, academicians and scholars who have closely watched and studied Nepal-China relations. He said China's peaceful and tremendous economic growth had become possible only in the last three decades of its history. Highlighting the main features of the book, Prof. Dr. Krishna Pokharel said that China was developed owing mainly to its vision of economic prosperity rather than relying only on national politics. 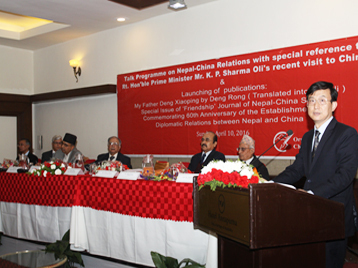 He further added that thought provoking articles contributed by political leaders, academicians, journalists and scholars from different institutions dealing with Nepal-China relations had basically focused on China's diplomacy which played and continues to play a crucial role in maintaining bilateral, regional, neighborhood and global relations. Prof Pokharel mentioned various writers who commented, in their articles, on China's progress in elevating neighborhood relations to a new height. Meena Vaidya Malla, Head of the Department of Political Science at TU, said that the book intensively and extensively talked about Nepal-China relations, including proactive roles and initiatives taken by China in every sector. This, she emphasized, was the attraction of the book. . This book has also tried to explore areas in which China was seeking to enhance cooperation with neighborhood countries and across the globe under the new leadership. Representatives of the political parties mentioned above dwelt extensively on age old intimate and cooperative relations existing between Nepal and China and expressed gratitude to China for generous cooperation and help extended to Nepal. They hoped that China's continuous progress would also contribute to the development of Nepal and benefit its people. 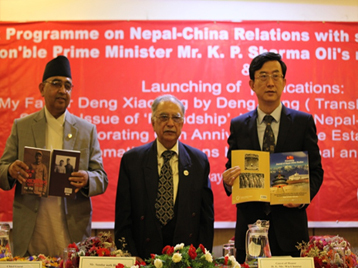 H. E. Wu Chuntai appreciated the effort made by China Study Center in contributing to the promotion of Nepal-China relations by publishing a very important book on China’s diplomatic initiatives under President Xi Jinping. 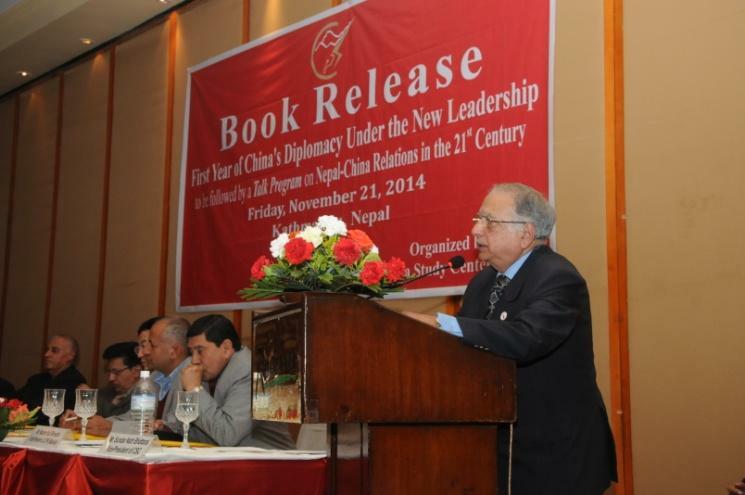 The book, he said, contains many important articles on China-Nepal relations. Ambassador Wu Chuntai also highlighted the importance of Nepal-China relations in the 21st century and opined that bilateral relations will continue to grow in the coming days and gain a new height by entering into strategic partnership. Before concluding the function, Mr. Sundar Nath Bhattarai, Vice-Chairman of China Study Center, proposed a Vote of Thanks to all the dignitaries, scholars, experts, academicians, representatives of political parties, Ambassadors and all those present at the function for their participation and making the function a success. Defense Attaché of the Chinese Embassy to Nepal Senior Colonel Cheng Xizhong, accompanied by Assistant Defense Attache visited China Study Center (CSC) the other day to exchange views on contemporary bilateral ties with the senior functionaries of the CSC. Describing the security cooperation between China and Nepal as excellent that supports territorial integrity of each other as its core, Mr. Cheng underlined the need of better understanding and cooperation between the business and investment communities of the two countries for fast tracking infrastructure building in Nepal with the government's policy enabling this process. The eight-member strong CSC side, which was led by its Chairman Mr. Madan Regmi, reciprocating Mr. Cheng's views, emphasized on the strength of the bilateral ties where Chinese investment and technology could provide an adequate boost in harnessing Nepal's natural and cultural resources. The exchange of views was undertaken in a candid and cordial atmosphere. Sr. Col. Cheng presented books to the CSC. BEIJING, Oct. 25 (Xinhua) -- Chinese President Xi Jinping has said here that China would strive for a sound neighboring environment for its own development and seek common development with neighboring countries. At a conference in the capital on diplomatic work, Xi stressed the necessity of good diplomatic work in neighboring countries to realize the "centenary goals" set by the 18th CPC National Congress in November 2012: a moderately prosperous society by 2021 and a prosperous, strong, democratic, culturally advanced, harmonious and modern socialist country by 2049. CPC leadership in previous generations attached high importance to diplomacy with neighboring countries, raising important issues and guiding policy, opening up a generally sound environment, laying the foundation for diplomatic work, Xi said at the conference held on Oct. 24 and 25. All members of the Standing Committee of the CPC Central Committee's Political Bureau attended the conference. On the basis of ensuring continuity and stability in China's foreign policy, the CPC Central Committee actively plans and manages China's diplomacy, and carried out a series of major diplomatic activities after the 18th CPC National Conference, with particular attention to neighboring countries. With respect to geography, the environment and intertwined relations, Xi said the neighboring region has major strategic significance. Dealing with neighboring countries "should have a three-dimensional, multi-element perspective, beyond time and space". In reviewing China's situation, Xi said there had been lots of changes in relations between China and its neighbors. "Our economic and trade links are closer, with unprecedented interactive exchanges," he said. "The situation requires us to keep pace with the times and be more active in blueprinting diplomatic strategy and undertaking diplomatic work," he said. China's neighborhood, full of vigor and vitality, boasts obvious advantages and potentials in development. The region is stable on the whole, and most of the neighboring countries have a friendly and mutually beneficial relationship with China, Xi said. In diplomacy, one must understand the trend of the time, devise strategy and plan carefully, Xi said. The strategic goal of China's diplomacy with neighboring countries is to serve the cause of national rejuvenation, for which China must consolidate its friendly relations with neighboring countries and make the best use of the strategic opportunities China now has, according to Xi. We must strive to make our neighbors more friendly in politics, economically more closely tied to us, and we must have deeper security cooperation and closer people-to-people ties, Xi said. He emphasized that the basic tenet of diplomacy with neighbors is to treat them as friends and partners, to make them feel safe and to help them develop. Friendship, suggested Xi, is the consistent principle of China's diplomacy with its neighbors and sincerity is the way to cultivate more friends and partners. Cooperation with neighbors should be based on mutual benefit and create a close network of common interests. Only through better integration of China's interests with neighbors' can they benefit from China's development and China benefit from theirs, Xi said. Underlining the importance of tolerance, Xi stressed that the Asia and Pacific region is big enough for all countries to develop, and that countries in the region must promote regional cooperation in an opener mind and with greater enthusiasm. China itself must embrace and practice these idea so that they will become the shared belief and norms of conduct for the whole region, said Xi. Xi stressed that the Party must deal with issues strategically by making improvements to planning and operational capability, maintaining that great efforts need to be made to safeguard peace and stability in the region. "The path of peaceful development is the Party's strategic choice, in line the times and the fundamental interests of the country. 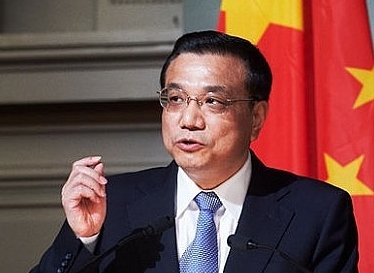 A major purpose of this diplomacy is peace and stability in the region," Xi said. 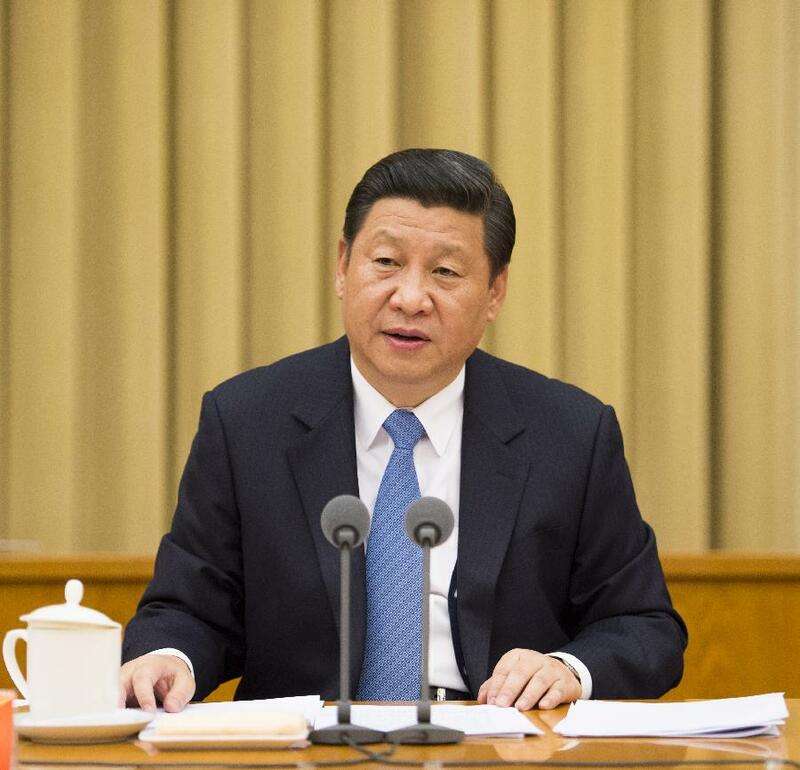 Great efforts must be made towards win-win reciprocity, accurately identifying convergence points for cooperation; making use of China's advantages in economy, trade, technology, and finance; and actively taking part in regional economic cooperation, Xi said.h He said China should work with its neighbors to hasten interconnectivity and establish a Silk Road economic belt and a maritime silk road for the 21st century. China should accelerate establishment of free trade zones, with neighbors as the foundation stone, expand trade and investment and create a new pattern of regional economic integration. He said China should continuously expand regional financial cooperation by playing an active role in establishing an Asian investment bank for infrastructure construction and improving the regional financial safety network. He urged accelerating opening up of border areas and deepening reciprocal cooperation between Chinese border areas and neighboring countries. Xi said efforts shall be made to promote regional security cooperation, noting "security cooperation is the common need of all." A new outlook on security, featuring mutual trust, reciprocity, equality and coordination, should be adhered to, Xi said, reiterating China's push for comprehensive, common and cooperative security. China should advance security cooperation with neighboring countries, actively participate in regional and sub-regional security cooperation, and enhance cooperation mechanisms and strategic mutual trust. Xi also called for public diplomacy and people-to-people exchanges between China and neighbors for the long-term development of relationships. Diplomatic relations rely on the bond between the peoples, he said. People-to-people exchange should involve tourism, technology, education and sub-national cooperation, among others, to make many different kinds of friends. "We should clearly present our policies to the outside world, tell China's story in an acceptable way, speak out so that we are heard, and interpret the Chinese dream from the perspective of the aspiration of all people in all countries for a better life and regional prosperity, and let the sense of common destiny take root with our neighbors. Policy and strategy are the lifeline of the party along with its diplomatic work, Xi said. He urged keeping in mind both the domestic and international situations, noting the domestic focus is on the centenary goals and the "China Dream" while the international objective favorable external conditions for China's reform, development and stability, safeguarding national sovereignty, security and development, safeguarding world peace and stability and promoting common development. "We should seek common ground and converging interests, stick to the sound value of justice and benefit, have principles to act upon, cherish friendship and righteousness, and offer more assistance to developing countries within our capacity," Xi said. "We should make arrangements to coordinater diplomatic work, and give full play to various departments to achieve greater progress," he said. Xi said diplomatic work is arduous and formidable, but called on comrades undertaking diplomatic work to enhance their senses of responsibility and urgency, and engage in disciplined diplomacy with dedication and innovation. Chairing the conference, Premier Li Keqiang said the event was of great significance in implementing the spirit of the 18th National Congress of the CPC and making best use of an important period of strategic opportunity in China's development. Fourth, the specific reference to safeguarding overseas interests is undoubtedly the highlight of Li Keqiang’s government work report. Li’s report promised to “resolutely safeguard its sovereignty, security and development interests, and fully protect the legitimate rights and interests of Chinese citizens and business overseas.” This sentence actually fits with the spirit of the Central Committee. The 18th National Congress of CPC Central Committee, held at the end of 2012, included the maintenance of the interests of the Chinese citizens and business overseas in the report. Li’s work report affirmed this idea, both as a theme and as an important guide for future actions. In addition, the promise to maintain rights and interests overseas has paralleled the need to maintain national sovereignty, security and development interests. Both reveal China’s rising concern with interests abroad. Fifth, the informal meeting of APEC leaders is the only specific diplomatic event mentioned in the government report this year, showing the high level of importance the Chinese government attaches to hosting this event. The past several work reports had mentioned the Beijing Olympic Games and the Shanghai World Expo, so we can reach the conclusion that the Chinese government considers the importance of Beijing hosting APEC’s informal leadership meeting as roughly equivalent to hosting the Olympic Games and the World Expo. The government considers the APEC meeting an important stage to display the new image of China. This will be a top priority of China’s diplomatic work this year. On the afternoon of October 14th, 2013, Song Enlei, secretary-general of the China Association for International Friendly Contact (CAIFC), met in Beijing with the third group of young students from Nepal who came upon the invitation of the CAIFC in a 10-people delegation. The delegation was led by Narayan Sharma, principal of Budhanilkantha School and was composed of members from different nationalities, regions and classes in Nepal. Secretary-General Song extended his welcome to the visiting students on behalf of the CAIFC and indicated that the CAIFC is willing to enhance the Sino-Nepal folk exchanges with China Study Center in Nepal as well as other friendly organizations. He hoped that the young students can assume the important responsibility of deepening the traditional Sino-Nepal friendship. The students actively shared their feelings about the visit in China and expressed that they will work hard to make contributions to promoting the Sino-Nepal friendship. Principal Sharma appreciated it that the CAIFC attaches much importance to the friendly exchanges between Chinese and Nepalese students and he, on behalf of Budhanilkantha School, sent his best wishes to the Chinese people through the CAIFC. The meeting coincided with Dashain, the most important traditional festival in Nepal. Secretary-general Song extended his warm wishes to the delegation. A six member delegation of Beijing NGO Association for International Exchanges led by Ms. Zhou Jing, Associate Counsel of Beijing Women's Federation visited the China Study Center on 23 October 2013 and exchanged views with the leaders of the China Study Center on various aspects of China-Nepal relations. Both sides agreed to work together to promote Nepal-China relations on the people-to-people level and stressed on the importance of this relation. CSC Chairman Mr. Madan Regmi, CSC General Secretary, Dr. Upendra Gautam, and Executive Member, Mrs. Deepa Pradhan participated in the meeting. 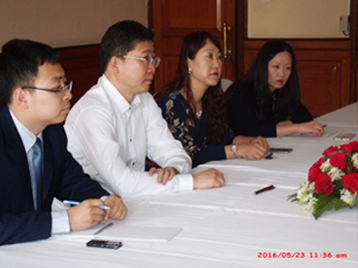 The Chinese delegation of BNGOAIE comprised of Mr. Li Junguo, Consultant of Beijing Municipal Lawyers Association, Ms. Ya Jiying, Deputy Secretary General of Beijing Youth Development Foundation, Ms. Yue Yuzhen, Council member of Beijing Youth Federation, Ms. Liu Yuqing, Project manager of Beijing NGO Association for International Exchanges, and Ms. Huo Jinhua, Senior Expert of Beijing Volunteer Federation. Since the successful conclusion of the 18th National Congress of the Communist Party of China (CPC) last year and the end of the annual sessions of the National People's Congress (NPC) and the National Committee of the Chinese People's Political Consultative Conference (CPPCC) earlier this year, the Party Central Committee with Comrade Xi Jinping as General Secretary has, in light of new conditions and new tasks, focused on China's long-term and strategic agenda with a keen appreciation of the evolving global environment and trends of development at home. Bearing in mind both the domestic and international interests of the country and maintaining the continuity and consistency of its major diplomatic policies, it has promoted innovations in diplomatic theory and practice by keeping up with the trend of the times and pushing ahead with a pioneering spirit. With a good beginning made and an overall plan adopted, the Party Central Committee has put forth many important strategic ideas on China's external affairs as well as diplomatic policies and principles, and taken a number of major diplomatic initiatives which have not only created external conditions favorable for facilitating the work of the Party and the state across the board, but also enriched and developed the system of diplomatic theory with Chinese characteristics. I. The new diplomatic initiatives as taken are strategic, overarching and innovative in nature. Given close international attention on major policy direction of the Party Central Committee with Comrade Xi Jinping as General Secretary after the 18th Party Congress, Comrade Xi Jinping made his diplomatic debut by meeting the representatives of foreign experts working in China. Later, the Political Bureau of the CPC Central Committee held a collective study session on unswervingly following the path of peaceful development. On both occasions, Comrade Xi Jinping made important remarks on China's opening-up strategy and foreign policy, sending out a clear message that China's new collective central leadership is committed to reform and opening-up, the path of peaceful development and the strategy of win-win cooperation with the outside world while resolutely upholding China's core national interests. Since the end of the annual NPC and CPPCC sessions this year, Comrade Xi Jinping and other Party and state leaders have paid visits to major countries, neighboring countries, emerging market economies and developing countries in Asia, Africa, Latin America, Europe and North America, and hosted visits by dozens of foreign leaders. These activities of bilateral and multilateral diplomacy both at home and abroad have enabled Chinese leaders to meet more than one hundred foreign heads of state and leaders, which has effectively enhanced China's friendly exchanges and pragmatic cooperation with other countries. Actively promoting relations with the major countries. Comrade Xi Jinping made Russia the first leg of his first overseas visit as China's President, which strengthened bilateral cooperation in the economy, trade, energy and strategic security and consolidated the basis of the China-Russia comprehensive strategic partnership of coordination. Comrade Xi Jinping held meetings with US President Barack Obama at the Annenberg Estate in Los Angeles, during which the two sides agreed to work together to build a new model of major-country relationship based on mutual respect and win-win cooperation, thus charting the course and drawing the blueprint for growing China-US relations in the future. China and the United States also successfully held their fifth round of Strategic and Economic Dialogues, making good progress in implementing the agreement of the two presidents and advancing the building of a new model of major-country relationship. With other Chinese Party and state leaders visiting European countries, China has played host to French President Francois Hollande and other European leaders, and worked steadily to open up new areas of mutually-beneficial and pragmatic cooperation between China and Europe. Energetically working to stabilize and advance the friendly and good-neighborly relations in the surrounding areas. China's relations with its neighbors are, on the whole, moving towards a more favorable direction. While attending the Boao Forum for Asia Annual Conference 2013 and the state events held on its sidelines, Comrade Xi Jinping expounded on the new ideas in China's domestic and foreign policies, which promoted China's strategic trust with the relevant countries and elevated its relations with the neighboring countries. We have received visits by state leaders from neighboring countries, such as President Truong Tan Sang of Viet Nam, President Park Geun-hye of the ROK and Prime Minister Nawaz Sharif of Pakistan, strengthened bilateral ties with neighboring countries in areas including Southeast Asia and Central Asia, and consolidated our good-neighborly friendship and cooperation with them. With respect to such issues as Diaoyu Island and South China Sea, we have acted firmly to uphold our territorial sovereignty and maritime rights and interests while working hard to appropriately handle and resolve the disputes with the neighboring countries through dialogue and negotiation. On the Korean nuclear issue, while firmly committed to the goal of denuclearization on the Peninsula, we have actively reached out to relevant countries to move the situation on the Peninsula towards relaxation. Vigorously working to strengthen friendship and cooperation with developing countries. Comrade Xi Jinping's successful visits to Africa and Latin America have fully reflected the great importance we attach to developing countries. By visiting Tanzania, South Africa and the Republic of the Congo, Comrade Xi Jinping set a precedent for a Chinese head of state to visit Africa during his first overseas trip. What is more, he met with over a dozen African leaders at a breakfast meeting, with fruitful results achieved in renewing friendship, enhancing mutual trust, advancing cooperation and identifying opportunities for common development. By visiting Trinidad and Tobago, Costa Rica and Mexico and holding bilateral talks with leaders of eight Caribbean countries, Comrade Xi Jinping has enhanced China's political trust and result-oriented cooperation with them and brought China's overall cooperation with Latin America and the Caribbean to a new high. Deeply engaging in and shaping processes of multilateral diplomacy. When meeting leaders of international organizations, Comrade Xi Jinping stressed China's commitment to the advocacy and practice of multilateralism and the great value it places on the important role of the United Nations and other international organizations. China will honor its due international obligations and work in close cooperation with relevant international organizations in maintaining world peace and security, promoting human development and progress and addressing global issues and challenges. Fresh progress has been made in China's relations with major international organizations. Attending the Fifth BRICS Leaders' Meeting in Durban, South Africa, Comrade Xi Jinping worked for closer communication and coordination with other major developing countries on global economic and political matters of great consequence and brought about progress in building BRICS mechanisms. The Summit issued the eThekwini Declaration and Action Plan, decided to establish a development bank and a contingent reserve arrangement among BRICS countries, thus providing a strong impetus to the establishment of a new international political and economic order that is fairer and more equitable. The Party Central Committee with Comrade Xi Jinping as General Secretary has made innovative headway on the basis of past achievements. A sound and momentous beginning has thus been achieved in our diplomatic work. With the layout being more comprehensive and more balanced, China's diplomacy under new circumstances displays such features as rich ideas, clear priorities, firm positions, flexible approaches and distinctive styles. This has not only aroused greater interest of all parties to further grow relations with China, which paves the way for sound diplomatic work in the latter half of the year and even the next five to ten years, but also boosted the morale of the Party, the army and the people, thus greatly galvanizing the enthusiasm of our Party and our people of all ethnic groups to work for the realization of the "two centenary goals" as set by the 18th Party Congress. II. Innovations in diplomatic theory and practice have resulted in major achievements. Confronted with a highly complex international situation, the Party Central Committee with Comrade Xi Jinping as General Secretary has carried forward the Party's fine tradition of linking theory with practice, made courageous explorations by combining domestic affairs with foreign affairs and integrating Chinese features with the trend of the times, and achieved a series of major breakthroughs in diplomatic theory and practice within a very short period of time. Displaying a strong resolve for innovation, a broad, strategic and forward-looking global perspective, and a capacity to command the overall situation, the Party Central Committee with Comrade Xi Jinping as General Secretary has provided a powerful guarantee in both theory and practice for innovative diplomatic work and better use of the important period of strategic opportunities. 1. Putting forth the important thinking of the Chinese dream with profoundly enriched contents with a view to boosting exchanges and cooperation between China and the rest of the world. During his trips abroad or meetings with visiting foreign guests at home since the 18th Party Congress, Comrade Xi Jinping has spoken profusely to leaders and people of foreign countries on the important thinking of the Chinese dream, namely, to achieve the great renewal of the Chinese nation. Comrade Xi Jinping has emphatically pointed out that the Chinese dream is shared by the Chinese people of all ethnic groups and cherished by each and every individual in the country. The Chinese dream requires a peaceful and stable international and neighboring environment, and China is committed to realizing the dream through peaceful development. Since the Chinese dream is closely linked with the dreams of other peoples around the world, China is committed to helping other countries, developing countries and neighboring countries in particular, with their development while achieving development of its own. China will share more development opportunities with other countries so as to facilitate their efforts to realize their dreams. China hopes to see win-win cooperation and common development with the rest of the world. While working to realize the Chinese dream, the people of China are desirous of realizing the world dream through concerted efforts with people around the world. Comrade Xi Jinping's comprehensive, profound and exquisite description of the Chinese dream is a continuation and development of the important thinking of China's peaceful development in the new era. It has enhanced international understanding and recognition of China's peaceful development strategy and received extensive appreciation and applause. Many foreign leaders and people from various sectors regard the Chinese dream as fully consistent with the dreams of their own countries and own peoples, and have expressed readiness to join the Chinese people in realizing the beautiful dream shared by the entire mankind. This fact has dealt a powerful blow to the attempts by certain international forces at distorting and smearing the Chinese dream. The important thinking of the Chinese dream has not only energized our people's determination and confidence in accomplishing the great renewal of the Chinese nation but also substantially boosted China's appeal and influence in the world, enhanced our stature and voice in international affairs and given full expression to the strong synergy between our domestic and external agenda. 2. Putting forth the vision of building a new model of major-country relationship between China and the United States while striving to advance relations with other major countries. To promote the building of a new model of major-country relationship between China and the United States and bring about sound interaction and win-win cooperation with major countries is an important thinking of the Party Central Committee with Comrade Xi Jinping as General Secretary concerning China's relations with other major countries. The thinking is a strategic choice made based on a full review of the experience and lessons of history, a correct reading of the trend of the times and a need to integrate China's interests with those of other countries. It is also the inherent requirement of the "two centenary goals" and the inevitable demand for our overall strategy of peaceful development. China and the United States have reached important agreement on the building of a new model of major-country relationship. During their meetings at the Annenberg Estate, Comrade Xi Jinping and President Obama agreed that the two countries would work together to build a new model of major-country relationship that benefits both peoples and the people in the world. Comrade Xi Jinping summarized such a new model with three insightful sentences. First, non-conflict and non-confrontation. That requires the two sides to view each other's strategic intention in an objective and sensible way, stay as partners instead of adversaries, and properly handle their differences and disputes through dialogue and cooperation instead of taking a confrontational approach. Second, mutual respect. That requires the two sides to respect each other's choice of social system and development path, respect each other's core interests and major concerns, seek common ground while shelving differences, uphold inclusiveness and mutual learning, and make progress side by side. Third, win-win cooperation. That requires the two sides to abandon the zero-sum mentality, accommodate the other's interests while seeking one's own, promote common development while developing oneself, and continue to deepen the pattern of shared interests. Comrade Xi Jinping also pointed out that to implement the agreement on the building of a new model of major-country relationship, the two sides need to bring their dialogue and trust to a new level, take new steps in their pragmatic cooperation, establish a new pattern of major-country interaction, and explore new ways to manage their differences. The building of a new model of major-country relationship between China and the United States is an unprecedented endeavor that will inspire future generations. It is a historic innovation that has no ready experience to copy. As such, it may not be a plain sailing process. Nevertheless, as long as we size up the situation, focus on the goal, be firm in our determination and keep forging ahead, we will be able to achieve sound and steady growth of China-US relations. Meanwhile, with active planning and facilitation, China's relations with other major countries have also made fresh progress and breakthroughs. China and Russia have deepened strategic trust, scaled up business cooperation, made new breakthroughs in major energy cooperation projects, maintained close coordination on major international and regional issues and in global economic governance, and achieved new progress in growing their comprehensive strategic partnership of coordination. China and the European Union have expanded cooperation areas, deepened shared interests, and continued to elevate strategic relations and cooperation to new heights. We have also made active efforts and achieved notable results in developing friendship and cooperation with other major developing countries and major regional countries. 3. Putting forth the right approach to upholding justice and seeking interests with a view to enhancing friendship and cooperation with neighboring countries and developing countries. To strike a balance between upholding justice and seeking interests is at the heart of traditional Chinese culture and a moral benchmark observed by the Chinese nation throughout the centuries. This important principle governs both personal conduct and China's relations with other countries. Inheriting the fine traditions of Chinese culture and the diplomacy of New China and keeping in mind the new tasks in the new period of China's relations with other developing countries and its neighbors, Comrade Xi Jinping underscores the need to adopt the right approach to upholding justice and seeking interests in growing relations with these countries. Politically, we should uphold justice and fairness as a guiding principle. Economically, we should pursue mutual benefit and common development. In growing relations with our neighbors and other developing countries that have long been friendly towards China yet face daunting challenges in development, we will accommodate their interests rather than seeking benefits at their expense or shifting troubles unto them. We will follow the right approach to upholding justice and seeking interests in strengthening relations with our neighbors and other developing countries. During his visit to Africa, Comrade Xi Jinping had sincere and cordial discussions with African leaders, in which he expounded on China's Africa policy and stressed China's commitment to cooperation with Africa with sincerity, real results, affinity and good faith. In particular, he emphasized the win-win nature of China-Africa cooperation. He reiterated that China will fully honor its commitment to Africa, attach no political strings to aid to Africa, help African countries translate their strength in natural resources into progress in development and achieve diverse, independent and sustainable development. Comrade Xi Jinping's remarks struck a chord among African leaders and people. Many of them said that China's help to Africa is sincere and aims at boosting Africa's development and that Africa has full trust in China. During Comrade Xi Jinping's visit to Trinidad and Tobago and Costa Rica, a large number of major cooperation projects were agreed upon, which testifies to China's sincerity in helping Central American countries to achieve development. Comrade Xi Jinping announced that China would provide preferential loans and special infrastructure loans to Caribbean countries having friendly ties with China, and this was warmly received. Comrade Xi Jinping's visit to Mexico boosted bilateral business ties, and the two sides announced the upgrading of China-Mexico relations to a comprehensive strategic partnership. 4. Proposing stronger top-level designing and strategic planning in diplomatic work including the bottom line thinking with a view to resolutely upholding China's core interests. Comrade Xi Jinping has repeatedly called for stronger top-level designing and medium to long-term strategic planning for China's diplomatic work. The Party Central Committee, demonstrating a long-term and broad vision and bearing in mind the underlying trend and major events, has stepped up such efforts by integrating China's relations with the world's major countries, its neighbors and other developing countries and multilateral diplomacy through a series of major initiatives. This has promoted an all-round growth of China's relations with various parties, meeting our target of a good start and solid layout in our diplomatic work and setting the stage for the medium and long-term pursuit of our objectives. The Party Central Committee with Comrade Xi Jinping as General Secretary attaches great importance to the details of implementing China's foreign policy. It calls for the need to follow new trend in strategic planning, to make timely policy adjustments in light of shifting international developments and the changing external environment, and to properly address new issues and problems in our diplomatic work. We must keep in mind the bottom line, working for the best but preparing for the worst. Comrade Xi Jinping has stressed that while firmly committed to peaceful development, we definitely must not forsake our legitimate interests or compromise our core national interests. No country should expect us to swallow the bitter fruit that undermines our sovereignty, security and development interests. In our diplomatic work, we will not dodge disputes or problems as there may be. Rather, we will endeavor to properly handle the differences and problems with relevant countries, while working to promote exchanges and cooperation in various fields to expand common interests and maintain good relations with neighboring countries and peace and stability in the region as a whole. 5. Putting forth the need for enhanced coordination in diplomatic work to ensure unified central leadership over the operations. To better coordinate the country's domestic and international agenda, the Party Central Committee attaches great importance to a holistic management of foreign affairs. It calls for balanced considerations, overall planning, unified command and coordinated implementation. It requires the central and local governments, non-governmental organizations and all foreign-related agencies to work together to form synergy, with each performing their respective functions. We should fully motivate all the parties involved and spark their creativity, and at the same time subject their activities to the unified management guided by national interests. Efforts should be made to ensure the smooth exercise of leadership by the Party Central Committee in decision-making, management and specific handling of foreign-related affairs so as to realize its strategic intentions in diplomatic work. In the past six months, by strengthening institution-building, sorting out relevant systems and mechanisms and formulating clear-cut regulations, the Party Central Committee has succeeded in improving the management of foreign-related work with stronger and better coordinated operations. III. We must earnestly study and apply the achievements of innovations in diplomatic theory and practice to make new progress in diplomatic work. China's diplomatic work under new conditions, which got off to a good start, has proceeded from a stage of planning to one of all-round implementation. Taking stock of the overall developments, we find ourselves still in an important period of strategic opportunities in which much can be accomplished. Yet we also face complex and daunting challenges. The important achievements of innovations in diplomatic theory and practice made by the Party Central Committee with Comrade Xi Jinping as General Secretary have not only laid a solid foundation for our diplomatic work in the immediate future, but also pointed out its correct direction. We should earnestly study and fully appreciate the essence of these innovations, draw inspirations from them and apply them in our diplomatic practice. We should build on the good beginning and forge ahead in a pioneering spirit. While continuing to improve on the strategic planning, we should give greater play to the leading role of leadership diplomacy, vigorously grow relations with other major countries, step up friendship and win-win cooperation with our neighboring countries and other developing countries and move the international order in a more just and equitable direction. We should work hard to popularize the new thinking and new ideas of Chinese diplomacy, implement the Party's mass line and people-oriented diplomacy, and endeavor to make new progress in our diplomatic work, thus creating a more enabling external environment to make the Chinese dream, the great renewal of the Chinese nation, come true. On the occasion, Mr. Madan Regmi, Chairman of China Study Center shed light on Nepal-China relations in historical and contemporary perspective and stressed on the need for helpful attitude to speedy and smooth implementation of Chinese projects without letting any room for hazards which have been apparent in some instances in recent days. China's investment and development assistance to the developing countries in Asia, Africa and Latin America have yielded beneficial result. We should also create congenial atmosphere for Chinese investment to produce maximum benefits. H.E. Mr. Wu Chuntai, the Ambassador of China to Nepal, who was the chief guest of the pragramme, and who jointly released the book together with former Vice-Chancellors Tribhuvan University Prof. Kedar Bhakta Mathema and Prof. Dr. Madhav Prasad Sharma, in his remark, said that the book on China's new leadership was timely and commendable and appreciated the effort of China Study Center for its contribution in informing the Nepalese people about China, its new leadership and its policies. He further said that China's new leadership which has been in office for the six months has already started making its sincere effort in several domains of governance. 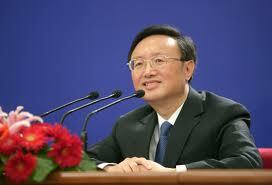 He also said that Nepal China relations have great prospect to develop under the new leadership of China. Prof. Dr. Mohan Lohani, the programme coordinator and the chief editor of the book, highlighted the objectives of China Study Center and expressed happiness at being able to bring out a book on China's new leadership. He added that its policies will have direct bearing on Nepal-China relations for a long time to come. He hoped that the book will be a good reference book for all scholars. Mr. Sundar Nath Bhattarai, Vice-Chairman of the China Study Center, who was presiding over second session of the pragramme of ' Interaction on Nepal -China Relations', in his opening remark said that the policy of the new Chinese leadership and the theme of 'Chinese Dream' as expounded by President Xi Jinping envisages a strong, prosperous, egalitarian and corruption free China and, in the external domain, China capable of piloting a harmonious, mutually cooperative and prosperous world order. He also said that Nepal and China are true and reliable neighbors and the relationship between them is marked by mutual trust, respect and cooperation which has grown in complete absence of antagonism, irritation and problem of any sort. Nepal, he said, looks with admiration at the ascending progress made by China and looks forward to benefit and enrich itself from the experiences of China's development. In the second session of interaction on Nepal-China relation Mr. Pradip Gyawali, intellectual and prolific writer and Prof. Dr. Madan Dahal gave exhaustive accounts of political and economic aspects of Nepal-China relations respectively and dwelt upon various prospects of the relationship which will further strengthen the Nepal-China relationship for mutual benefit in the days ahead. While summing up the outcome of both the sessions of the progamme, Prof. Dr. Tri Ratna Manandhar, who presided over the first session gave a critical review of the book and said that Nepal-China relations should continue to be nurtured to mutual benefits of both the countries and their people. H. E. Mr. Wu Chuntai, the Chinese Ambassador, while taking the floor during interaction, said that Nepal is an important friend of China and will benefit from China's development and that China is ready to share its experiences with Nepal. He also replied to queries and comments made by participants during the session. Wu Chuntai, newly appointed Chinese ambassador to Nepal, visited China Study Centre (CSC), Kalikasthan Marga, Dillibazar, Kathmandu on April 12, 2013. He was greeted by Madan Regmi, Chairman of CSC and his team. Chairman Regmi took him around the Center and briefed him about the activities of the Centre. Chairman Regmi with his colleagues welcomed ambassador Wu and his team and said the Center has been emphasizing on people to people relationship. The Centre has 90 plus members in it central Kathmandu office and 16 branches spread around Nepal. It has been publishing and translating original manuscripts about China and its Tibet and Taiwan territories aiming at educating and disseminating correct information about China. Ambassador Wu appreciated the initiatives taken by CSC and also arranging this interaction. He appreciated the warm and consistent friendship of Nepali people. He sees a bright future of Nepal. The country is bestowed with plenty of natural resources including water resources and scenic beauty suitable for sustainable tourism. Nepal's strategic location provides ample opportunities of development. He said that Nepal is rich with at least four positive criteria (4 Ss) which are smile, sun (good nature), Sagarmatha (Mount Everest) and Siddharth Gautam (Lord Buddha). He further mentioned that he would recommend more and more Chinese to visit Nepal, the relationship between Nepal and Tibet will be further enhanced. He explained, the Syabrubesi-Kerung- highway took 10 years to complete. But this is a pride of the Nepali and the Chinese technicians as they ultimately mastered the steep slope which is impossible for most of the others. Nepal's plan to make high way along the middle hill is also praiseworthy as this will develop feeder roads and develop villages which will reduce emigration. He mentioned that China would provide soft loan for infrastructure development, promotion of private business, assist in developing biotechnology, use of technological advancement, help in tourism industry and service sector. These are some of the areas of mutual cooperation. He said, China recognizes Nepal's Sovereignty He said, he was highly impressed with the Capacity and resilience of Nepalese in resolving post-conflict period. The post conflict countries usually take longer period of time to settle but Nepal even conducted a general election and conflicting political parties even sit together for dialogues in a friendly manner despite apparent wrangling. . This is very unique not found anywhere in the world. Ambassador Wu concluded his remarks by extending his best wishes to the Center and said his first official meeting with the Center was very helpful and should be a regular feature of his ties with the Center. Newly appointed Chinese ambassador to Nepal Wu Chuntai presented his Letter of Credence to President Ram Baran Yadav at the latter's office, Shital Niwas, on Monday, 11 March 2013. Wu, a carrier diplomat, had arrived in Nepal last week, to head the Chinese mission after his predecessor, Yang Houlan, was transferred from Kathmandu to Myanmar. Wu is a law graduate from the University of Cambridge. After presenting the Letter of Credence, the Chinese Ambassador met Deputy Prime Minister and Foreign Minister Narayan Kaji Shrestha at the Foreign Ministry. In the meeting, both sides emphasized that the Nepal-China relations would be further consolidated in the days to come. The envoy said China would like to bring more economic benefits to the neighboring countries through the ever growing Chinese economy. “Nepal will be the priority. His Excellency Mr. Wu Chuntai was warmly greeted by the Chairman of China Study Centre, Mr. Madan Regmi, who extended hearty welcome to him, on behalf of the members of China Study Centre, on his appointment as Ambassador Extraordinary and Plenipotentiary of the People’s Republic of China to Nepal both of which harbour very close, friendly and good neighbourly relations between them. Mr. Regmi also pledged, on behalf of the Centre, full cooperation and support to H.E. the Ambassador in the discharge of his functions and his endeavours in enhancing the friendly relations existing between the two countries for mutual benefits. He wished him all the successes during his tenure and expressed confidence that Nepal-China relations will be further strengthened and that it will attain a new height during his good office in Nepal. French Brigadier General Alain Lambelle, president of the Union of the Association of the Institute of Higher Studies of National Defence, Association of Asia / Middle East situated at Ecole Militaire in Paris, France made a visit to the office of China Study Center on February 22, 2013. The visit was arranged through Mr. Ratna Sansar Shrestha, Senior Water Resources Ananlyst. Brigadier General Lambelle, during his career in the French army had also served as Defence Attaché in the French Embassy in Pakistan. After his retirement from regular service, General Lambelle concentrated in pursuing his interest in foreign relations. He has authored four books on relations between South Asian countries and China and has extensive study on use of water resources of the region. During his visit to China Study Center, comprehensive discussion was held between General Lambelle and Chairman Madan regmi of the Centre who was accompanied by its Vice-chairman, Mr. Sundar Nath Bhattarai, former Nepalese Ambassador, Dr. Upendra Gautam, General Secretary of the Center, Dr, Mohan Lohani, former Nepalese Ambassador and Mr. Iswor Onta, President of Jalasrot Vikash Samstha which is associated with Global water Partnership, on matters of the Sino-Nepalese relations in the context of growing relations between China – South Asian countries and Nepal’s rich water resources potential including its optimum utilization and many other related aspects of south Asian political development in recent days. "We should steadily improve the party's art of leadership and governance"
Senior experts of China Foreign Affairs University (CFAU) affiliated with China's Ministry of Foreign Affairs and Peking University (PU) were in Nepal for a week long visit of Nepal at the invitation of China Study Center (CSC). Prof. Gao Fei, Director of Center for China Diplomacy Studies at the CFAU and Prof. Kong Fan-jun, professor of the School of International Studies, PU paid the visit for understanding the contemporary internal and external related issues Nepal has been experiencing in the early years of 21st century. To recall, after receiving observer status in South Asian Association for Regional Cooperation (SAARC), China has recently appointed its Ambassador to Nepal as also its envoy for the SAARC. During their stay in Nepal Prof. Gao and Prof. Kong visited, the birth place of Lord Gautam Buddha the Shakyamuni, Limbini which is consider as one among the three holiest land in the earth. They also went to Pokhara a panoramic city situated by the side Fewa lake and the lap of Machhapuchre Himalayan range. In Kathmandu the Chinese Professors duo visited the sites of Nepal's ancient heritage (enlisted in the UNESCO) and hold meeting with the officials of the China Study Center. Views were exchanged on bilateral and international issues. Present on the occasion were CSC Chairman , Mr. Madan Regmi, General Secretary, Dr. Upendra Gautam, Executive Member, Dr. Prakash Raj Neupane, CSC Adviser and Former Ambassador , Prof. Dr. Mohan Lohani, CSC Adviser and Former Ambassador, Mr. Rajeshwar Acharya, , CSC Member and Former Ambassador Mr. Gopi Nath Dawadi. A five member delegation of China Study Center (CSC) visited China from October 28, 2012 to November 5, 2012 at the invitation of its Counterpart China Institutes of Contemporary Relations (CICIR), a well-known think-tank of People's Republic of China. The CSC delegation led by CSC Chairman Mr. Madan Regmi comprised of CSC General Secretary Dr.Upendra Gautam, Executive Member Mr. Hiranya Lal Shrestha, Member, Mr. I. R. Onta and Executive Member, Dr. Prakashraj Neupane. During the week-long visit, the delegation of CSC took part in a workshop meeting with CICIR. The workshop was participated by the CSC delegation and CICIR Vice-Chairman, Prof. Yang Mingjie, Prof. Hu Shisheng, Director of Institute of South & Southeast Asian and Oceania Studies and other experts on Asian Affairs. The CSC delegation attended the dinner hosted by CICIR President Mr. Cui Liru and exchanged views on bilateral relations. The delegation called on Mr. Ai Ping, Vice-Minister of International Department, Central Committee, and Communist Party of China and had an extensive dialogue on Nepal-China relations. Likewise, the CSC delegation held parley with Mr. Chen Zuming, Vice-chairman of China Association for International Friendly Contact (CAIFC), the first counterpart association of CSC and attended the dinner hosted by him. The delegation also visited Sanya, an extremely beautiful coastal city of Hainan Province and Guangzhou, the well-known industrial city of China. Madame Wang Lixin, Charge d' Affaires a.i. of the Embassy of the People's Republic of China in Kathmandu was welcomed by the Chairman and Executive members of China Study Center on her visit to the Center on 16th of May, 2012. On the occasion of this visit, there ensued a very fruitful discussion between the senior officials of China Study Center and Madam Wang on further strengthening of cooperative relation between the Chinese Embassy and China Study Center, besides a comprehensive discussion on the whole gamut of Nepal-China relations. Mr. Madan Regmi, the Chairman of the Center, while emphasizing on age-old traditional and friendly relations existing between Nepal and China, appreciated the support of the people and the Government of China to Nepal's development, peace and stability. He also informed Madam Wang about the activities of China Study Center and explained that, within its limited capacity, the Center has maintained regular friendly contact and exchange of visits with its counterpart association and various socio - cultural and academic communities of China in reciprocity. The talk was held in a very cordial, free and frank manner and covered both positive as well as week points of relations. During the talk, some members expressed views on the need of more enduring Chinese participation and involvement in useful and tangible projects in Nepal. Madam Wang explained that China will continue to support efforts made by Nepal to uphold state sovereignty, independence and territorial integrity and will extend all possible cooperation in Nepal's economic development to its capacity. Explaining that the recent visit of premier Wan Jiabao to Nepal promoted the relations between the two countries to a new height, she hoped that Nepalese scholars shall offer their views on further development and promotion of Nepal-China comprehensive cooperative relations. 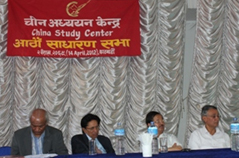 Eighth General Assembly of China Study Center was held on 14th April, 2012, at Kamaladi Banquet Hall, Kathmandu. At the beginning of the assembly, one minute's silence was was observed in memory of Center's advisors Yubraj Singh Pradhan, Mohamud Habbibulah, Govind Bhatta and the founder executive member Shadmukh Thapa who passed away last year. The assembly expressed condolence on their death and commended their contribution made to the Center during their life time. Members attending in the Eighth General Assembly. Mr. Madan Regmi, the Chairperson of the Center, inaugurated the formal proceeding of the assembly. In his opening speech, he highlighted the significance of the Center in strengthening and promoting the policy-based strategic relationship between Nepal and China. He said that in future as well, the Center will continue to play meaningful role in promoting people to people relationship between the two countries. The Secretary General of the Center, Dr. Upendra Gautam, presented the Center's 8th general assembly report which included the Center's activities over the the last three years. He said that the Center regularly organized seminars, workshops, conferences, and talk programmes despite inadequate means of support. He stressed on developing the Center as a humble but effective organization dedicated to its objective. 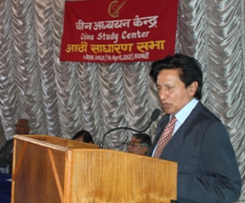 Prof. Ganga Prasad Upreti, the Treasure of the Center, presented the fiscal report of the last three years. 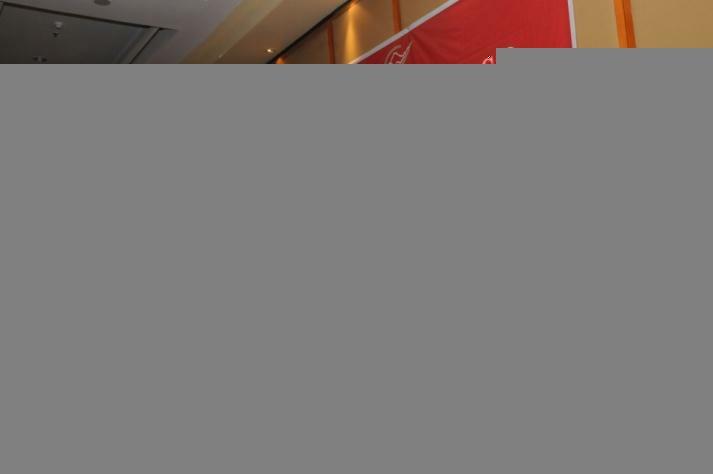 He presented also an estimated budget of income and expenditure for the coming fiscal year. Thereafter, members in the assembly raised questions and also offered critical uggestions to strengthen the functioning of the Center in future. The General Secretary Dr. Gautam and the Treasurer Mr. Uprety responded to the questions raised from the floor and assured the members that their suggestions would be taken into consideration in the Center's activities in the future. The Secretary of the Center Mr. Prakash Babu Paudel informed the assembly about the procedure of the election of the executive body for the next term. All the members unanimously voiced that the incumbent Chairperson Mr. Madan Regmi should be elected for the next term too. 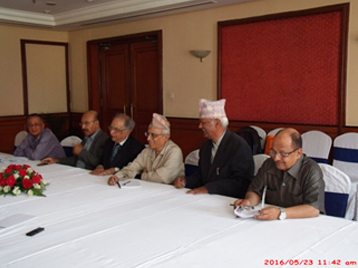 They also authorized the incumbent Chairperson Mr. Regmi to form a new executive committee. As per the suggestion of the assembly, the Chairperson Mr. Regmi read out the names of the executive members and the advisors for the next term. He added few additional names to honor the suggestions given by the assembly members. The official visit of Premier Wen Jiabao to Nepal on 14th of January 2012 was a hallmark visit of immense importance at a critical time when Nepal is passing through a historical political transition. Premier Wen was received in the airport by the Nepalese Prime Minister Dr. Babu Ram Bhattarai and held official talks with him including one to one talks. According to Prime Minister Bhattarai the Chinese Premier suggested that Nepal have balanced relations with both her neighbors. Chinese Premier Wen Jiabao (C, front) is accompanied by Nepalese Prime Minister Baburam Bhattarai (R, front) during the welcoming ceremony in Kathmandu, Nepal, January 14, 2012. Chinese Premier Wen Jiabao, left, speaks with Nepalese President Ram Baran Yadav during a meeting in Katmandu, Nepal, Saturday, January 14, 2012. 8. Exchanges of notes on Chinese assistance in building Armed Police Force Academy. The joint statement released at the end of the official visit emphasized that the relationship is characterized by equality, harmony, co-existence, ever lasting friendship and comprehensive cooperation for which both sides decided to further promote everlasting Nepal-China friendly relation on the basis of five principles of peaceful-coexistence. It also marked the year 2012 as Nepal-China year of friendly exchanges. The joint statement also did not miss to "congratulate the official opening of the second road link between Nepal and China, Syafrubesi-Rasuwa Gadhi Road." The official visit of Premier Wen Jiabao to Nepal was an important confirmation of the continuity of visits by each and every Prime Minister of China. The continuity was accomplished in succession since the very foundation of the People’s Republic of China in 1949, beginning with the visit of the first Prime Minister Zhou Enlai to the current Prime Minister Wen Jiabao. This signifies the importance attached to Nepal-China relations by high Chinese leadership. We still cherish with warm memory the visit by paramount leader of modern China, H.E. Mr. Deng Xiaoping to Nepal in 1978, which was his one and the only as well as the first country in South Asia in his itinerary, which he visited just after the opening of China to the outside world and initiation of China’s modernization drive. This gave a singular honor and pride to all Nepalese people as a whole. Other important visits were by the Chinese President H.E. Mr. Li Xiannian in 1984 and President H. E. Jiang Zemin in 1996. China’s expressed wish for Nepal’s successful conclusion of the peace process and the completion of drafting of the constitution, and its readiness to help Nepal in its socio-economic development will go a long way in further cementing the close and friendly neighborly relations between the two countries. The most important matter, in entirety, is that both sides should be ever alert and effortful in nurturing their long existing relations by understanding each other’s genuine concerns and aspirations. The 21st century advacnces in science and technology of communication transport have given a new meaning to Nepal-China geopolitical ties. We would like to end our statement with what Chinese Foreign Minister Yang Jiechi said on 19 janyary 2012 in Beijing. Summing up Chinese Premier Wen Jiabao's just-concluded Nepal visit, he predicted a new leap forward in the development of the bilateral relations. He has further said, "The Nepalese government, political parties and all social sectors have demonstrated a strong consensus on the China-Nepal ties and offered unflagging support for China's core concerns." 1. Mr. Yang Yiping, Vice President, Shanghai Municipal Federation of Literary Art Circle. 2. Mr. Pu Lunxin, Vice President of Beijing People’s Art Theatre, International Liaison Department, CFLAC. 3. Mr. Quai Zenming, Secretary General, Artist’s Association of Xinjiang Uyghur Autonomous Region. 4. Mr. Cao Jung, Deputy Chief of European and African Affairs. The delegation was warmly welcomed and received by various literary and art circles of Nepal. The delegation also had very cordial meeting with the officials of China Study Centre (CSC). Mr. Madan Regmi, the Chairman of the Centre, welcomed the Chinese delegation and had exclusive discussions with its members, which was followed by a luncheon organized in their honour by the Centre. Prominent writers, poets and members of arts and culture of Nepal such as Mr. Dwarika shrestha, Mr. Krishna Bhakta Shrestha and the officials of the China Study Center, Mr. Sundar Nath Bhattarai, Vice-Chairman, Dr. Upendra Gautam, General Secretary, Prof. Ganga Prasad Uprety, Treasurer and Mrs. Sulochana Manandhar, member were also present on the occasion. Both sides were of the view that concrete programmes had to be made in order to enhance the relations in the field of culture and arts between our two countries. They decided to make efforts for more exchanges of visits of artists and literary figures and organization of regular cultural activities between the two countries. They also agreed to pursue consultation in future for further promotion of bilateral cultural and artistic relations between them. China Study Center (CSC) of Nepal and Tibet Academy of Social Science (TASS) of China signed an agreement specifying provisions for academic cooperation between the two organizations on 15 December 2011. The simple signing ceremony took place at the CSC central office in Kathmandu. A visiting 3-member delegation of TASS led by its Vice-president Prof. Sun Yong and Mr. Madan Regmi, Chairman of CSC signed the accord representing their respective instaurations. This was the first agreement signed by CSC with the neighboring regional social science academy of China. CSC in the previous years has signed agreement of mutual cooperation with the state-level China Association for International Friendly Contact (CAIFC) and China Institutes of Contemporary International Relations (CICIR). At the invitation of China Study Center, combined delegation of Shenzhen Municipal Congress and Shenzhen People’s Association for Friendship with Foreign Countries arrived at Kathmandu on 10th of December 2011 for a four day visit. This eight member delegation was led by Mr. Zhou Guangming Vice-Chairman, the Standing Committee of Shenzhen Municipal Congress. The delegation called on Hon'ble Minister of Local Development Honour Mr. Top Bahadur Rayamajhi at the latter's office on 11th of December and had comprehensive exchange of views on latter's of the two counters. Mr. Madan Regmi, Chairman of the China Study Center hosted a Dinner in honour of the delegation on the evening of 11th of December. The dinner was attended by the leaders of the CSC and Dr. Mahesh Maskey Ambassador designate to PR China. The delegation was also received by the Executive head of the Kathmandu Metropolitan, Mr. Kedar Nath Adhikari, on the 12th of December at the latter's office. During the meeting, both side expressed their eagerness to establish sisterly relation between Kathmandu Metropolitan and Shenzhen Municipality and agreed to pursue it further through exchanges of visits in nearest possible ties. The Kathmandu Metropolitan also hosted a luncheon in the delegation's honour. The delegation is departed on 14th of December 2011 as per its schedule after having a overnight stop over in tourist site of Nagarkot hill, east of Kathmandu. Mr. Sundar Nath Bhattarai, Vice-Chairman of the China Study Center along with Mr. Shubash Kaji Shrestha, General Secretary of Mid-western Chapter, Banepa of China Study Center, accompanied the delegation to most of their programmes while in Kathmandu. China Study Center organized a seminar on Nepal-China relations, which was participated by foreign policy experts, academia and Chinese diplomats, senior political leaders and a three member delegation from China Institute of International Studies (CIIS) led by its Vice-president Mr. Dong Manyuan. A comprehensive paper on ' Nepal- China Relations: A South Asian Perspective' was presented by Prof. Lok Raj Baral, a foreign affairs scholar and former ambassador to India and another research based and analytical paper presented in the seminar was by Dr. Bama Dev Sigdel which was entitled 'China-Africa Economic Relations: Lesson to Developing Countries, Including Nepal' Both the paper dealt extensively on historical perspective of Nepal-China relations and future prospects of great advantages which Nepal can accrue from the growing economic strength of the People's Republic of China. Chinese head of the delegation Mr. Dong was of the opinion that China attached great importance to Nepal-China relations and will continue to increase assistance for Nepal's economic development. Stressing on the significance of Nepal-China relations Mr. Dong said, 'Nepal-China relations are solid like the Himalayas and higher than Mt. Everest." Dr. Mohan Lohani, who was coordinator of the seminar from China Study Center highlighted the social, cultural and economic ties between Nepal and China while summarizing the main points emphasized by the authors in their presentations. Dr. Upendra Gautam, General Secretary of the Center introduced the paper presenters,Prof. Baral and Dr. Sigdel, Mr. Sundar Nath Bhattarai, Vice-Chairman of the China Study Center delivered a vote of thanks and expressed, on behalf of the Center, its greatfulness to the participants of the seminar including the member of the Chinese delegation from CIIS whose participation was facilitated by the good office of the Embassy of China, and in particular, H. E. Ambassador Mr. Yang Houlan. The seminar was one day affair and was concluded in a happy note on its successful completion with high level participation. A 10-member students' youth delegation visited China in the second part of September 2011. The delegation consisted of students of undergraduate programs and the acting campus chief of Siddhartha Vanasthali Institute, Kathmandu. The delegation visited Guanzhou, Changsha, Shanghai, Beijing and Xian and received first hand information and experience about China's economic, technological, commercial, cultural and educational development. Before the delegation's departure to China, it was provided orientation about China and Nepal-China relations by the experts and scholars of China Study Center. This study visit was sponsored by China Association for International Friendly Contact (CAIFC) in partnership with China Study Center (CSC). Nepal-China Friendship Youth Association provided support in the program planning. The delegation of the China Center for Contemporary World Studies led by Mr. Chen Jin, Vice Director of the Party Literature Research Center of the Communist Party of China (CPC) Central Committee paid a friendly visit to Nepal from July 14 to 17, 2011 at the invitation of the China Study Center. Other members of the delegation were Mr. Gao Yongzhong, Director of the Institute of Party Building under the Organization Department of the CPC Central Committee, Mr. Hu Yanxin, Official of the International Department, Central Committee of the CPC, Ms. Mu Jinling, Official of the International Department, Central Committee of the CPC. The CCCWS delegation was warmly received in the Tribhuban International Airport by the Chinese Ambassador H. E. Mr. Yang Houlan and Mr. Madan Regmi, Chairman of the China Study Center and other officials of CSC. The members of the CCCWS delegation included Mr. Gao Yongzhong, Director of the Institute of Party Building under the Organization Department of the CPC Central Committee, Mr. Hu Yanxin, Official of the International Department, Central Committee of the CPC, Ms. Mu Jinling, Official of the International Department, Central Committee of the CPC. The delegation of the China Study Center (CSC) paid a friendly visit to China at the invitation of China Association for International Friendly Contact (CAIFC), from 16th to 26th June, 2011. The CSC delegation was led by its Chairman Madan Regmi comprised of CSC Vice Chairman, Sundar Nath Bhattarai, who is also the President of the Association of Former Career Ambassadors of Nepal (AFCAN); Dr. Upendra Gautam, General Secretary, Prof. Ganga Prasad Uprety, Treasurer of CSC, also the Vice Chancellor of Nepal Academy and other two CSC members Rajiv Regmi and Deepa Pradhan. During its stay in China, the delegation visited Beijing, Dalian and Langzou, and had important meetings and dialogues with high officials of the CPC International Department, the Government and the Chinese think tanks. The meetings and dialogues concentrated on strategic and long term approach to China-Nepal ties. The delegation of the China Institutes of Contemporary International Relations (CICIR) Beijing, led by Prof. Hu Shisheng, Director of Institute of South & Southeast Asian and Oceania Studies of CICIR, paid a friendly visit to Nepal at the invitation of the China Study Center from July 26 to August 1, 2011. The Chinese delegation was warmly received in the Tribhuban International Airport by the officials of China Study Center. Other members of the delegation were Dr.(Ms) Huang Jing, researcher of Institute of European Studies, Dr. Chen Wenxin, researcher of Institute of American Studies, Dr. Wang Shida, researcher of Institute of South & Southeast Asian and Oceania Studies of CICIR. During their stay in Nepal, the members of the visiting delegation had important meetings with the high officials of the Government, scholars and experts of various spheres. A four-member delegation of China Association for International Friendly Contact (CAIFC) led by its Deputy Secretary-General Mr. Liu Jian visited Nepal from June 4 to June 9, 2010 at the invitation the China Study Center (CSC). The delegation was received by CSC General Secretary Dr. Upendra Gautam. Other members of the CAIFC delegation included Dr. Wang Wei, Director, Center of South Asian Studies, CAIFC, Mr. Li Qiang, Scholar, Center for Peace and Development Studies, CAIFC and Mr. Xu Yang, Scholar, CAIFC. During their stay in Kathmandu the delegation exchanged views, among others, with Mr. Krishna Bahadur Mahara, Foreign Department Chief of UCPN (Maoist), Nepali Congress Acting President Mr. Sushil Koirala and CPN (UML) Foreign Department Chief Mr. Khadga Prasad Oli. A four-member delegation of China Study Center (CSC) led by its Chairman Mr. Madan Regmi, which left for the People's Republic of China on Sunday, the 12th of September 2010 at the invitation of China Institutes of Contemporary International Relations (CICIR) returned home on 19th September 2010. During its sojourn in China the CSC delegation attended bilateral workshop at CICIR and exchanged views on bilateral, regional and international issues. The delegation called on a highly placed official of International Department of Central Committee of CPC and with the officials of its another counterpart organization China Association for International Friendly Contact (CAIFC), and other scholars and journalists. After its programme in Beijing, the CSC delegation went to Shanghai and observed the Shanghai World Industrial Expo 2010 where the Nepal Pavilion was a star attraction. The Nepal pavilion owned the heart of the visitors by introducing them the rich cultural heritage of Nepal, the birth place of Shakyamuni Gautam Buddha. The CSC delegation also exchanged views with the Vice-President and scholars of Shanghai Institutes of International Studies. The Jhapa Chapter of China Study Center was inaugurated by the Chinese Ambassador His Excellency Mr. Qiu Guohong on October 16, 2009 in Birtamod, Jhapa in eastern Nepal amidst rousing well come by the local people. The Ambassador while inaugurating the chapter emphasized on the need to enhance China-Nepal relations and reiterated China's pledge to support Nepal's sovereignty, independence, territorial integrity and development. Mr. Madan Regmi, Chairman of the China Study Center, distributed the certificates of membership of the officials and executive members of Jhapa Chapter. Mr. Regmi on the occasion underscored that Nepal-China relations is based on Panchceel and has bright future. He also condemned the efforts of some foreign and local media to tarnish the image of China Study Center and stressed that the Center will not succumb to any such blackmail as they are baseless and malicious in motivation. China Study Center published a special issue of its periodical Friendship dedicated to the 60th Anniversary of the founding of the People's Republic of China. Prof. Bishweshor Man Shrestha and Dr. Upendra Gautam are Editor-in-Chief and Consultant Editor of the Periodical respectively. The Journal opens with the text of speech delivered by President Hu Jintao of the People's Republic of China on October 1, 2009. It also contains message of Prime Minister of Nepal Mr. Madhav Kumar Nepal, Mr. Girija Prasad Koirala, Former Prime Minister and Chairman of Nepali Congress; Mr. Puspa Kamal Dahal Former Prime Minister and Chairman of Unified Communist Party of Nepal (Maoist); Mr. Jhalanath Khanal, Chairman, Communist Party of Nepal (Unified Marxist-Leninist); Mr. Kirtinidhi Bista, Former Prime Minister of Nepal; Mr. Qiu Guohong, Ambassador of the People's Republic of China to Nepal; Mr. Madan Regmi, Chairman of the China Study Center; Prof. Mohan Prasad Lohani, former Ambassador of Nepal to Bangladesh and Deputy Permanent Representative of Nepal to UN; Mr. Rajan Bhattarai, Foreign Affairs Advisor to Prime Minister of Nepal; Mr. Tika Jung Thapa, President, Nepal Council of World Affairs; Mr. Krishna Silwal, China Affairs expert and CSC Resident Advisor in Beijing; Mr. Y. B. Thapa, Former Member of National Planning Commission of Nepal; Dr. Upendra Gautam, General Secretary, China Study Center and Prof. Bishweshor Man Shrestha, Vice Chairman, China Study Center. China Study Center has come out with a Journal of International Affairs Vol.1, No. 1, April-September, 2009. The Chief Editor of the Journal is Prof. Dr. Mohan Lohani. Obama's Presidency: can it bring a real Change? by Mr. Madan Regmi; The Nepali Post-conflict: Prospects for Conflict Transformation and Democratic Consolidation by Dr. Saubhagya Shah; Nepal: Sandwiched Between Three Boulders by Prof. Dr. Sadmukh Thapa; The Role of Infrastructure in China-SAARC Relations: Moving Toward a Partnership of Common Prosperity by Bhaskar Koirala; China and Nepal face new cold war in the region by Dr. Upendra Gautam; Nepal-India Relations in post-April 2006 days by Prof. Dr. Ram Kumar Dahal, SAARC: Challenges and Prospects, by Prof. Dr. Mohan P. Lohani. China Study Center CSC)-Nepal formally launched a book on ""The Life of Nepalese Buddhist Master Buddhabhadra" by renowned Nepali Buddhist scholar Prof. Min Bahadur Shakya. 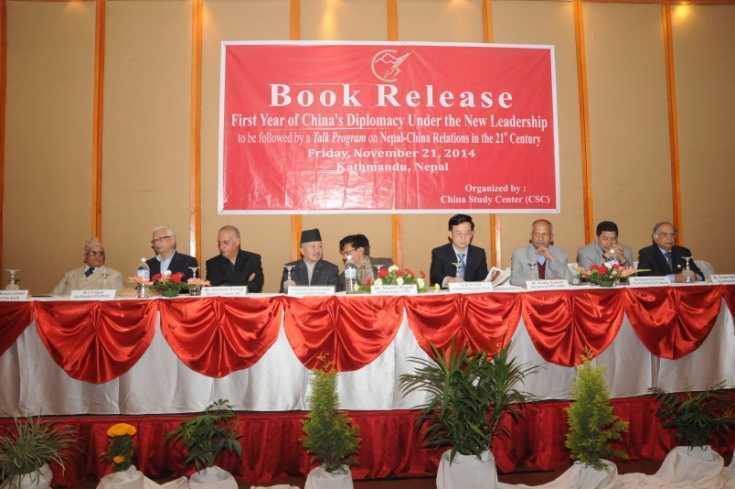 The launching of the book by Qiu Guohong, Chinese Ambassador to Nepal on 6th June 2009 marked the sixteenth hundred anniversary (409-2009 CE.) of Buddhabhadra (Fótuó-bátuóluó or Chwesian in Chinese) arrival in China and 10th anniversary of establishment of CSC-Nepal (1999-2009) in Kathmandu. However the fact that launching of the book was not an isolated event of significance of CSC-Nepal pertaining to research in Buddhism, the strongest cultural-historical foundation of Nepal-China relations-dating back to more than two thousand years. In CSC's program priorities, research in Buddhism is at the top because Buddhism that was transferred to China from Nepal provided the most enduring basis to China-Nepal relations even in these years of high heightened instability, New Cold War machinations and global economic and security disorders. The price of the book is NRs. 250 for Nepal and USD 20 for foreign countries. A journal titled Journal of International Affairs (April-September 2009) has been published by China Study Center- Nepal. Highlighting the contemporary world including SAARC through Asia, the journal contains research - oriented articles ranging from a critical assessment of the new American Presidency under Barack Obama, Nepal -China relation and South Asian regional affairs with focus on Nepal-India relations and SAARC with its challenges and prospects. The contents of the journal are in line with the CSC's policy to give priority to multi-faceted China related studies to further promote and consolidate age-old relation between China and countries of South Asia. Any reader of the journal will get analytical and critical insight into to the current and contemporary world affairs. The Journal features in-depth articles by Madan Regmi on "Obama's Presidency: a watershed - can it bring real Change? ;" Dr. Saubhagya Shah, "The Nepali Post - conflict: Prospects for Conflict Transformation and Democratic Consolidation;." Prof. Dr. Sadmukh Thapa, "Nepal Sandwiched Between Three Boulders;" Bhaskar Koirala "The Role of Infrastructure in China -SAARC Relations: Moving Toward a Partnership of common Prosperity;" Dr. Upendra Gautam, "China and Nepal face new cold war in the region;" Prof. Dr.Ram Kumar Dahal, "Nepal-India Relations in post April 2006 days;" and Prof. Dr. Mohan P Lohani, "SAARC Challenges and Prospects." The price of the publication is NRs. 250 for the Nepali nationals and US $ 10 for the foreigners. 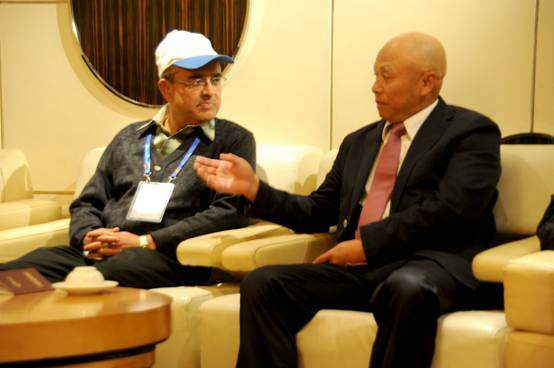 Li Shaoxian, Vice President, China Institutes of contemporary international Relations (CICIR) on 6 April 2009 said that his country is always committed towards the broader well-being of Nepal. Speaking at a program organized by China Study Center in honor of the visiting CICIR delegation led by him, he said that China will give more priority to its relation with Nepal in the days to come. Chairman Madan Regmi commending the role played by CICIR in consolidating Nepal-China relations through its academic endeavors said, "We look forward to work together in a more meaningful way in the days ahead for the mutual benefits of the two countries and people at large." Prof. B.M. Shrestha, Vice-chairman and Prof. Dr. U. Gautam, General Secretary of China Study Center-Nepal participated in the 4th Public Health Awareness Forum of UN-NGO-IRENE/Asia-Pacific and impact of global financial recession study tour program organized by China NGO Network for International Exchanges in Beijing, Xining and Guangzhou in March, 2009. 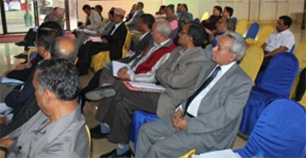 CSC-Nepal organized its 7th general assembly meeting in Kathmandu on 7th February 2009. The meeting concluded that the center should take initiatives to make Chinese people aware of the fact that Nepal is the birthplace of Shakyamuni Gautam Buddha. The assembly also proposed for special efforts to promote bilateral culture, tourism and seek economic collaboration from China to tackle the impact of global economic recession on Nepal. Liu Hongcai, Vice Minister of the International department of the central committee of the Communist Party of China (CPC), wished for the success of the ongoing peace process in Nepal. Addressing a cocktail dinner hosted in honor of the Chinese Communist Party delegation by the China Study Center on 5th of February, 2009, Vice Minister of the CPC Liu remarked that China wants to see Nepal's development in economic, social and political sectors achieving political stability. "We firmly believe, the political parties will establish stability in Nepal through consensus," he said and added, "China will remain a firm supporter of the ongoing peace process in Nepal." "During my visit, I had the chance to meet different political leaders and they were very much eager to further enhance neighborly and friendly relation with China, "he added. The Chinese leader also said, "The Nepali people have high regards for china as I discovered it when I met with common people here." He appreciated Nepal's "one china policy" and her support to make a success of the Beijing Olympic Games held last year, by providing security in Nepal-China borders. Lui hoped for further enhancement in bilateral relations in the days to come. Speaking personally, he said, "Although, this is my second visit to Nepal, I deeply loved this country as the Nepali people are very friendly towards China." Senior Chinese leader Liu citing on the recent global economic recession confessed that China has also been affected by the recession. He revealed that as exports were declining, many industries have been closed and millions of people have become unemployed. However to fight against that impact of the recession, China has taken up some economic measures to develop internal consumption, he revealed. Last year, China had to face serious natural calamity yet it achieved 9 percent growth rate, Liu informed. This year, although international automobile industries are facing serious challenges in the last two months, China has been able to establish a record of producing the largest number of automobiles in the globe, he informed. In 2009, as international consumption rate has increased---by 6 percent of the GDP in urban areas, and 8 percent in rural areas- China hopes to meet the target of 9 percent GDP in 2009, Liu estimated. Former ambassador Sundarnath Bhattarai, Vice Chairman of the China Study Center (CSC) in his welcome address, said, "the high level Chinese Leaders' visit have provided opportunities to have useful exchanges of views with various political leaders and other important persons on matters of bilateral relations and vital mutual interest. This visit provided the Chinese leader to witness Nepal's efforts for preserving and consolidating the gains of the recent historical changes and how Nepal is forging ahead in a bid to draft a new constitution for a stable, free, independent, sovereign and prosperous Nepal." Bhattarari urged for high level visits from China, including the visit of President Hu Jintao, who is well-known to many Nepalese during his long sojourn in Lhasa, Tibet Autonomous Region of China. Liu, leading a Chinese Delegation had arrived in Nepal to take part at the inaugural ceremony of the 8th convention of the CPN-UML in Butwal. At the reception, senior Maoist leader Mohan Kiran Baidya and Maoist ministers Krishna Bahadur Mahara and Janardan Sharma and other high level dignitaries were present. Vice Minister Liu met Prime Minister Dahal, President of Nepali Congress GP Koirala, CPN-UML leader Madhav Kumar Nepal, General Secretary JN Khanal. Sujata Koirala , Head of International Relations Department of the Nepali Congress hosted a luncheon in honor of Vice Minister Liu. On January 11, 2009 IAPS delegation joined an interaction program organized by Sujata Koirala, Head of International Relations Department of Nepali Congress at her residence. The scholars of both the countries discussed all important bilateral issues at the interaction program. 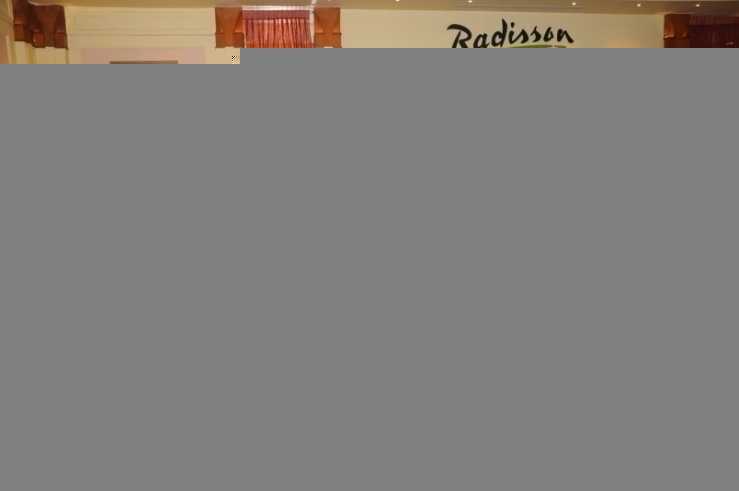 The Nepali side urged the IAPS delegation to help ease up the visa procedures for Nepali businessman. "Nepal and Nepali Congress will always stand for one-China policy," they said. Nepal will not allow its soil for use against any of its neighbors - India and China in particular, according to them. The Nepali scholars said China could invest in many sectors, including hydropower, information and communication technology, health, infrastructure, development and tourism, in Nepal. They said Nepal could develop itself as a communication and trade hub between India and China and stressed on the need to enhance Nepal-China connectivity through railway. Speaking in the interaction program Prof. Zhang Yuyan said," China's policy was to play more positive role in the regional development." The visiting delegation also interacted with Madhav Kumar Nepal, the Chief of the Foreign Affairs Department of CPN-UML It held a meeting with a CPN-Maoist team. 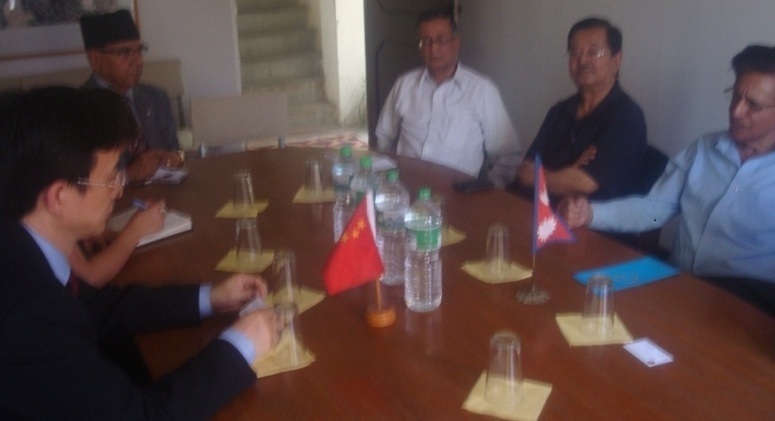 The meeting was led by CP Gajurel, Chief of Foreign Affairs Department of the CPN-Maoist. The IAPS delegation also met the Nepali state and non-state organizations dealing with academic, economic planning, political and foreign affairs. The IAPS delegation attended a reception hosted by Nepal Council of World Affairs. At the reception President of the Council Tika Jung Thapa said that the visit of the delegation would help people-to-people relation between Nepal and China. 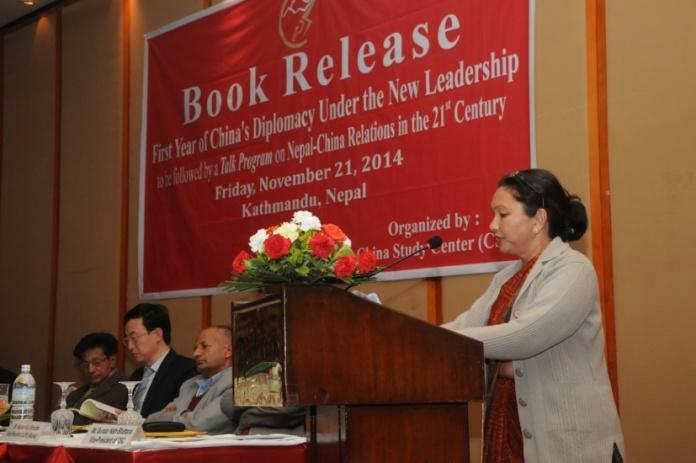 Thapa underscored that Nepal should learn from the fast development and progress made by China. In reply Prof. Zhang said that such kind of exchange would help find win-win solutions to benefit the two peoples. 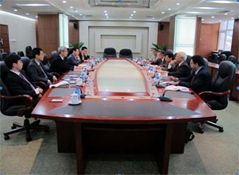 A four-member CSC on 17 October 2008 left for China at the invitation of China Institutes of Contemporary International Relations (CICIR), CSC's new counterpart and China's think tank of global standing. The delegation led by CSC's Chairman Madan Regmi consisted of Dr. Upendra Gautam, General Secretary, Dr. Vim Raj Adhikary, Member and vice Chairman, CSC Chitwan unit and CSC member Basudev Dhakal. During the week-long visit the delegation participated in a bilateral workshop with CICIR. The delegation held meetings with senior Chinese officials and major Chinese media organizations. It also visited places of ancient and modern importance in Guangzhou, Beijing, Suzhou and Shanghai. 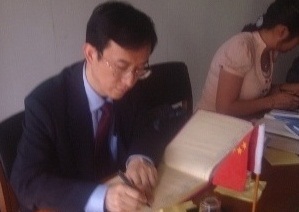 Ambassador of the People's Republic of China to Nepal Zheng Xianglin visited China Study Center (CSC) on 30 August 2008. 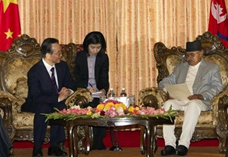 Zheng was accompanied by senior diplomats of the Chinese Embassy in Nepal. Underlining "the Center was unique and had its own characteristics," Ambassador Zheng appreciated the role of the center in promoting people-to-people contacts between China and Nepal. Ambassador Zheng joined a review and interaction program with the members of the Center on further strengthening China-Nepal cooperation, according to a press statement issued by the CSC. Ambassador Zheng emphasized on intensifying communication between the Chinese and Nepali sides to increase understanding about the current situation. On arrival at the Center Zheng was received by the officials and members of the Center Chairman Madan Regmi presented Buddha's idol as a gift of the CSC to Ambassador Zheng. The Center made contribution of Rs 20,000 to the relief operation carried out for the earthquake victims in China. "The Center hopes that Nepali people of all walks of life would make their contributions as per their capacity to earthquake relief operation as a token of friendship towards our neighbor China and its people," a press statement issued by the Center on 18 May 2008 Sunday. Report had it that more than 40,000 people dead, missing or buried under rubble in China's southwest, as the full horror of its devastating earthquake began to emerge. Assistant Minister of foreign affairs He Yafei said that China was looking forward to extend bilateral cooperation with Nepal. 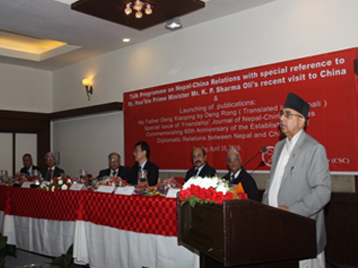 He was addressing a function organized by China Study Center to welcome the ten-member Chinese delegation to Nepal. He Yafei further said: Nepal should seek a development path that is suitable for itself. However, for the development, he said, the stability is the must. Yafei also mentioned that the upcoming Beijing 2008 Olympic was the biggest prestige issue for China, quickly adding that China would make the event a historic success. He Yafei was leading China's first official Foreign Ministry-delegation to Nepal in two years, resuming the formal channel between Chinese Foreign Ministry and Ministry of Foreign Affairs, which had been disturbed due to political instability in Nepal. While welcoming the Chinese delegation, Madan Regmi, Chairman of China Study Center, said that Nepal had steadfastly supported the One-China policy recognizing Tibet and Taiwan as inalienable parts of China. Regmi also said that Nepal expects full support and blacking of China as the country moves forward amidst a very critical time. The function was attended by CPN-Maoist Chairman Prachanda, UML General Secretary Madhav Kumar Nepal, Minister Sujata Koirala and Chief of the Army Staff of the Nepal Army Gen. Rookmangud Katawal. 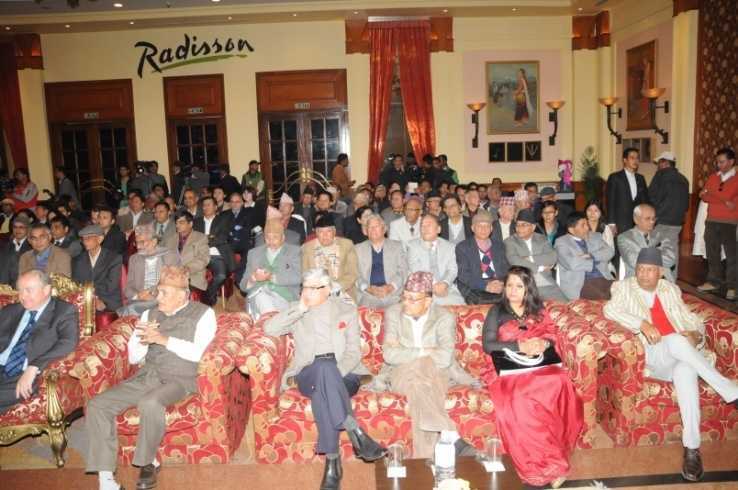 Other personalities attending the function were Ministers Dev Gurung and Krishna Bahadur Mahara, Government of Nepal Secretaries of Foreign Affairs, Law and Agriculture and other high ranking officials, intellectuals, leaders of various political parties, business and media. The visiting Chinese delegation met Prime Minister Girija Prasad Koirala, Chief of the Army Staff of the Nepal Army Gen. Katawal and Foreign Secretary Gyan Chandra Achrya. It also took stock of China-supported Air Cargo Inspection System, and ended the day doing diplomatic consultations in the Chinese Embassy. Assistant Minister Yafei has over 25 years of experience in Foreign Service. He started his career as Interpreter at the United Nations. Later on, he became First Secretary as well as Counselor at the Permanent Mission of China to the United Nations. He successfully completed diplomatic assignments in the USA, as in various positions in the Ministry of Foreign Affairs, China. He has been holding the current position since 2006.